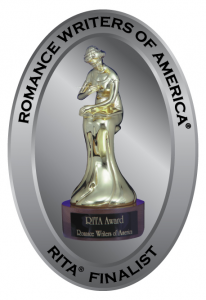 The RITA® award is Romance Writers of America’s highest award of distinction, recognizing excellence in published romance novels and novellas. Up to 2,000 romance novels and novellas from 12 different categories are judged each year in the RITA competition. After the first round of judging by fellow published romance authors, the competition narrows to approximately 100 finalists, who receive the notification in March. In 2017 my novel Tall, Dark and Damaged was named a finalist in the Romantic Suspense category. I liken the experience to getting an Oscar nomination! By far, it’s been the highlight of my career.